The Sprint Showdown, the opening event of the night for NASCAR’s All-Star race at Lowe’s Motor Speedway next Saturday, has become a preview of things to come – for that night and for the future in the Sprint Cup Series. In the Showdown, and in the Sprint All-Star Challenge all-star race that follows, drivers compete with no points on the line and little to lose. Not surprisingly, the sparks fly; literally and figuratively. But the preliminary event also offers a preview of things t o come down the road on the Cup circuit. Several of the sport’s top drivers got their first win at the Cup level in the Showdown, which has gone by several names over the years including the Winston Open, Winston Select Open and Nextel Open. Jeff Gordon’s first win in Cup came in the Showdown in 1994. He returned to Lowe’s Motor Speedway the next week and won the Coca-Cola 600. Tony Stewart won the Showdown in ’99 then got his first points win at Richmond that September. Steve Park followed his Showdown win in 2000 with a points win at Watkins Glen that summer. Brian Vickers, the ’05 winner, won at Talladega the next year. Johnny Benson’s lone Cup win, at Rockingham in 2002, came a year after his Showdown win. Martin Truex Jr. won the Showdown in 2007 then got his breakthrough Cup victory that June at Dover. Michael Waltrip won two Showdowns, in 1991 and 1992, and the All-Star race in ’96 before he ever won a points-paying Cup race. Last year’s surprise winner, A.J. Allmendinger, went on to put together a string of impressive finishes toward the end of last year to hang onto a ride when many thought his Cup career was done. 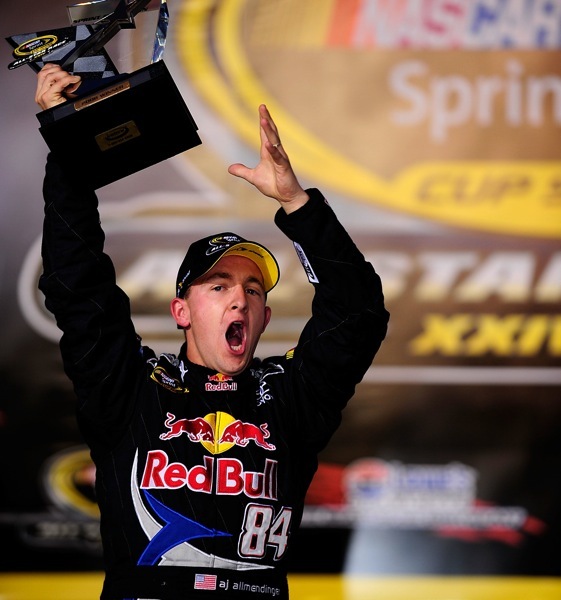 Drivers who have won the Showdown generally agree – a win is a win, no matter when and where it comes. “It was awesome,” Stewart said of his Showdown victory in his rookie season. “To do what we did, even though it wasn’t with a full field … just to win a race. Truex said his Showdown win laid the foundation for his victory at Dover a month later. “It was a great boost of confidence for our team,” he said. “I knew the team could do it, but until you get there, it’s always in the back of your mind. Michael Waltrip said his success in the Showdown and the All-Star race let him know that he belonged on the Cup circuit, even though he hadn’t won a points race at that time. “It was big for me because the Wood Brothers entrusted me with their car,” he said. “That’s a family team, and they’d had so much success at Charlotte with David Pearson and had picked me to drive their car.